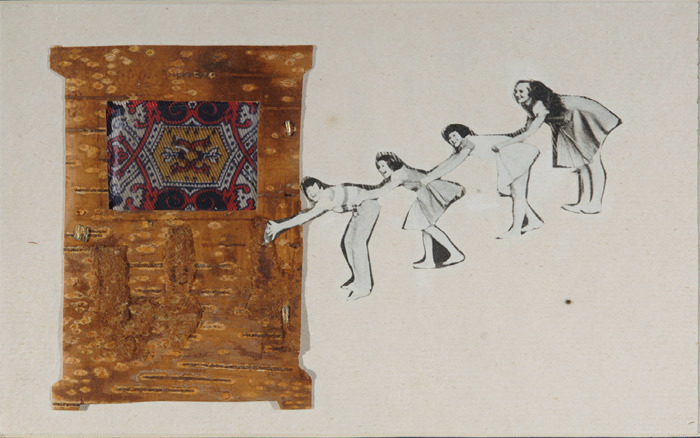 Sergei Paradjanov, The Departure of the Wardrobe, 1977, paper, tinted birch bark, magazine clipping, fabric, foil, 6 x 9 7/8". From the series “Inventory of Confiscated Belongings,” 1977. AS ONE APPROACHES the Sergei Paradjanov Museum, a modest stone building in Yerevan, Armenia, it is difficult to anticipate the size of its collection of Paradjanov’s work. More than six hundred collages, assemblages, photographs, drawings, original film posters, dolls, and costumes fill two floors of this former residential house, which also holds the Soviet filmmaker’s unpublished screenplays and his correspondence with directors such as Fellini and Tarkovsky. Accompanied by wall plaques in Armenian, Russian, and English, the works on view are densely installed, salon style, among vases, tapestries, and a humble dining table. 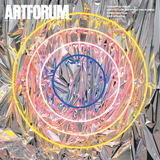 Since its opening in 1991, a year after Paradjanov’s death, the museum has become one of the city’s chief cultural centers, hosting talks, book launches, and Yerevan’s annual film festival.